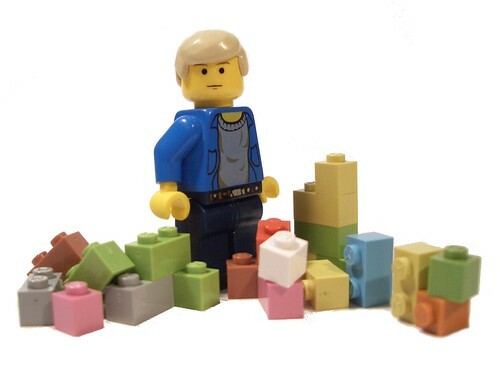 Have you ever heard of Modulex LEGO bricks? Modulex bricks are smaller than LEGO LEGO. Confused? 😀 Well even now in this information age its still hard to find much out about modulex. I hadn’t even heard of them before a few years ago. As you can see in the picture, they are a smaller, more pastel version of LEGO bricks. In the early 1960’s Godtfred was building a new house and, naturally, he tried to model the structure with Lego bricks. The problem was that the Lego, with an aspect ratio of 6:5, was different than standard European construction modules of 1:1. Rather than contend with the problems of using regular Lego bricks he simply had new, special bricks molded for him. Bricks that would allow him to more closely copy his architectural plans. These new bricks were based on a 5mm cube (1:1) and were about 5/8 the size of a standard Lego brick. After he finished his house model, Godtfred began to investigate the possibility of marketing these elements to architects and planners. In 1963 he created a new company, Modulex A/S. The M20 system, their first product, was intended for architectural modelling and consisted of a range of bricks, slopes, tiles, baseplates, windows and letter tiles based on the 5mm cube and intended for 1:20 scale building (hence the name M20). The system also included several unusual items, such as baseplate foil, a foil comb and cutter, even solvent-based glue. The early elements were molded by Lego and had the familiar “LEGO” logo on the studs. Later elements had a simple “M” (for Modulex) on the studs. And a new business. Now, I am a freelance LEGO Model Building and I write books that teach people how to build like a LEGO Master Model Builder. The first book is “How to Build a Round Ball with Square Bricks!” It shows you how to build a LEGO ball.